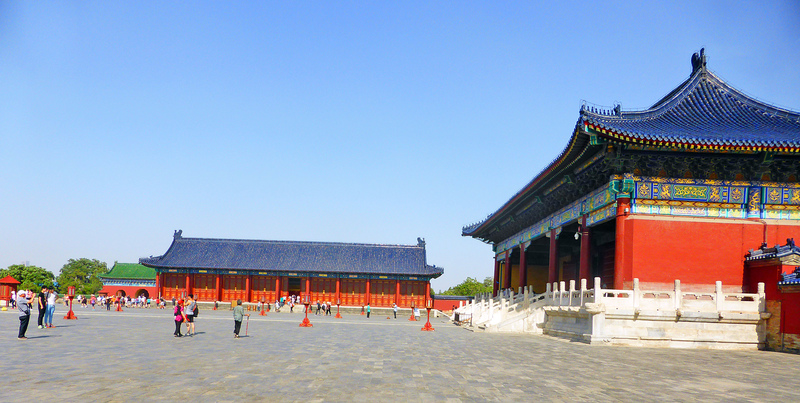 It is tempting to think that the Forbidden City constituted the whole of the Imperial palace at Beijing. But no, the Forbidden City is merely the inner part of the Palace and if one is to understand how the Palaces really worked, one must look at the rest of the Palace. The Forbidden City was surrounded by the ‘Imperial City’ which was six times as big, including a string of lakes. This is where the officials live and where the bureaucracy was carried out. This in its turn was surrounded by what is confusingly called the ‘Inner City’ and then in addition there is the ‘Outer City’ which is a southern addition which contained the other highlight of a Beijing visit, that is the Temple of Heaven. And then, to top it all, there is the Summer Palace, situated 10 miles to the north-west, in what is today the outer suburbs of Beijing, which is where the Emperor and his family actually lived for most of the time. The Forbidden City was essentially ceremonial, where the Emperor and his concubines ate and slept when they were on formal business. The working part of the Palace was in the surrounding area known as the Imperial city, which contained the granaries, the parks for the sheep and cows, the storehouses, and also the residences of the Princes and the major officials, and of course the all-important craftsmen, making the gifts for the Emperor to distribute, the speciality being clocks and watches. And there were also two large artificial lakes to provide water. 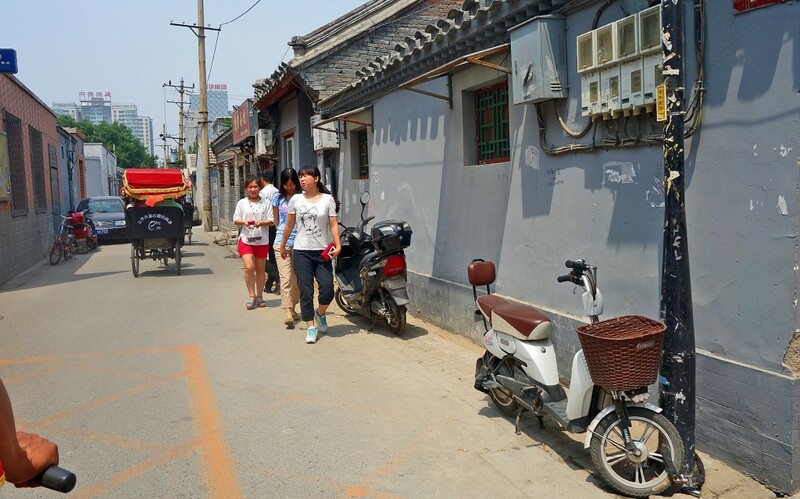 A Street in one of the Hutongs, only half modernized. Note the electric bike chained to the lamp-post – the battery is on the floor under the feet. The main feature of the Imperial city are the so-called hutongs. Hutong is a Manchurian word that has come to mean the typical dwelling in Peking, a courtyard house with rooms set of either side of the courtyard, the main room being on the north facing south and the Sun. Originally they were essentially dwellings of the ‘middle class’, but then in the 20th century they became slums, and in the modernisation programmes of the 70s and 80s they began disappearing rapidly. Since then a reaction has set in and everyone is busily trying to preserve them, and some of them have become quite chic, rather like mews cottages in Chelsea and are much sought after and become rather expensive. They are all inter-connected by lanes, and we went on a cycle rickshaw ride around the hutongs, to which is the thing to do for tourists. 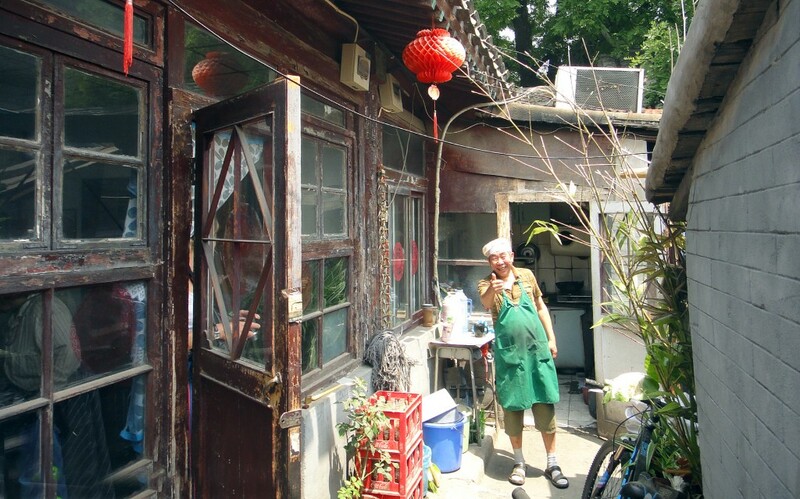 The chef in one of the hutongs. His father and his grandfather before had lived in the same house. We went for lunch in one of these hutongs, where the owner/chef assured us that his father, and like his father before him, had been a chef in the imperial service. 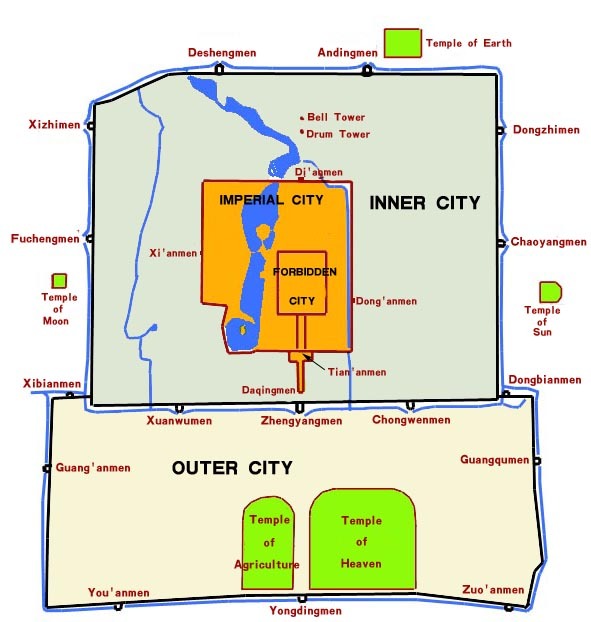 However outside the Imperial City was what is confusingly called the Inner City. This is partly based on an earlier version of Beijing, the Tartar city of Dadu otherwise known as Khanbalic laid out by Genghis Khan in 1264 as his southern capital – the Northern capital being Xanadu, 170 miles to the north. This is the town known as Cambaluc to Marco Polo, who visited there in the 1260s.The Walls mostly survived till the 1950s, when they were demolished to make way for the second inner ring road. A short stretch of the southern wall still survives in the City Wall Relics Park, south of the railway station. The Altar of Heaven in Beijing. The Chinese believe that the heaven is circular and the earth is square and that the colour of heaven is blue here. 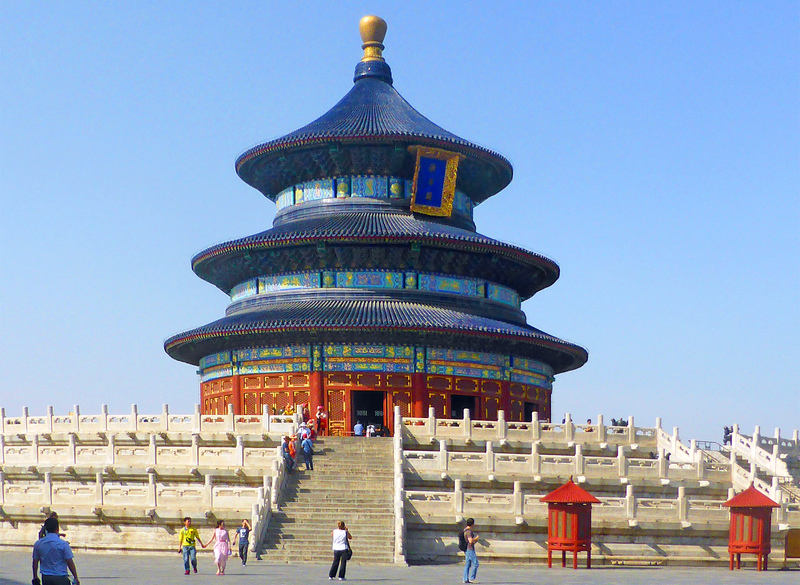 Here then is a circular temple with blue tiles, set on top of a four tiered podium – clearly a temple of heaven. However in 1553 the city expanded again with a great extension to the South known as the Outer City. A major feature of this was to enclose the Altar of Heaven that had been built again by the Yongli Emperor in 1430 – he must have been very busy building not only the Forbidden City but also the Imperial City, expanding he inner-city and outside it building the Temple of Heaven. At the centre is a superb circular shrine – it is not Buddhist but Taoist and not really a Temple but an altar where the Emperor went annually to give prayers for a good harvest. Two of the temples in the enclosure of the Temple of Heaven stop notice that both of them have blue time is. It is surrounded by three or four halls where other ceremonies were carried out. The palaces of Beijing are rather more important than the palaces of Western Europe, for they were not only Palaces, but also the seat of government and all control. To understand Chinese society, how it was organised and how it was ruled, one needs to understand the Palaces of which the Beijing Palace is the best surviving example. Everything centred round the Palace: it was the home of the ruler and the seat of all government. There were palaces in the rest of the country but none are so well preserved. But the pattern is also reflected in the towns, where the Yamen, or government offices, tended to be essentially mini-palaces. Outside the palaces there were the temples and the tombs and the great Buddhist monasteries, but there were few other form of corporate structure. Marketplaces were rare, and there were no places where people could assemble: there was no equivalent of the Roman amphitheatre where the populace could assemble – indeed any assembly of the population would be considered to be revolution. China was the supreme autocracy: this was the secret of its success – and also of its occasional failure.